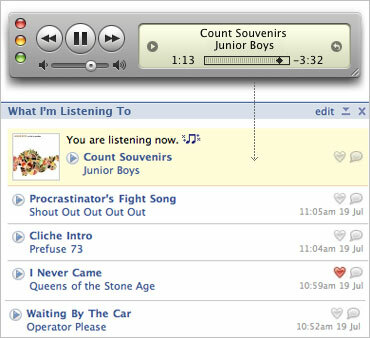 Today we’re launching a new Facebook application: What I’m Listening To. By far the most requested improvement to our first app was having your recently played music on your profile without having to click or interact with the app in any way. To address the challenge of updating a profile box on Facebook in real time, we developed an extension to our submission system that refreshes your Facebook profile whenever you scrobble a track. Rather than just release a rehash of some other fine apps already out there, we tried to come up with something extra that would thrive in the scope of Facebook’s social graph. So as well as being able to love tracks straight from your profile, you can now also add a pithy note or limerick to accompany each track you play. This is exclusive to Facebook for now, but we’ll be watching this one closely to see how we can appropriately integrate it on Last.fm. It’s taken us a few weeks, but we tried to keep it simple and useful, and sometimes the simplest things require the most thought. I always like to tell people that things are more complicated than they seem. I figured you were working on a now playing app. Good job for figuring it out! I like the new authentication system. I see the old application still does not feature this. But I think both applications should be using it. When I authenticate in one it should work for both applications. The Last.fm applications are some of the best on Facebook! Perfect. It’s exactly what I wanted. Cheers for the Facebook app. Nice work. Yes, I like this app… I installed it t’other day. Even before Muz and Hannah had – isn’t that something! Well, that’s all I’ve got to say… Keep up the good work. Brilliant. Although the Facebook app API thingie is totally broken when you submit comments or other stuff with special characters … :( I guess there’s nothing you can do to work around it..? Brilliant! What we all wanted. The next thing I’d love you guys to do is an EVENTS app. Facebook is a networking platform, and an events app would be infinitely useful for us gig-goers. I’d love it if this worked on another well known social networking platform… You know the one I’m talking about? Because I don’t have a facebook, and seeing this made me really want to get one. @ikefox: If you mean that site that starts with “My” and ends in “Space”, you can find all you want and more here on our widgets page. Awesome! Thanks for coming up with such a clean app. Will you have anything for Bebo anytime soon? ffs. I’m sure it’s been said before, but why don’t you guys spend fewer resources on these superficial, pointless little gizmos and more on getting this place operating to an acceptable level of efficiency? There have been so many issues with the site over the last few weeks, between slow load times and broken scrobbling and delayed charts… yet every time I look, instead of devoting your time to improving the core service, you’re telling us you’ve spent the last few weeks working on yet another needless myspace/facebook/whatever app. Surely these team members’ skills could have been better utilised in other areas? Get your house in order first, then start worrying about all this extra crap. It’s amazing! You guys are the best, thank you! This app would be perfect if you guys could add the artist quilts alongside it, like with the other “official last.fm” app. Chop Chop! Wish it would say what I am listening to on the last.fm player too. And if the track isn’t being played it would be nice to say last played instead of now listening. I’ll also put another request for a Bebo application. It’d be cool if when you clicked on a song though, it opened in a new window. Other than that it’s great! Just wanted to say thanks, guys. I like the application, but is there any way to make it so the played times show on the list on my profile in my time zone. It is currently BST and the times are showing as UTC (although other Facebook times such as post times are showing correctly). Regarding your comment on us not focusing our time and efforts on more pressing matters, I would like to point out, we’re more than aware of the site issues at the moment and are working on them. I would also like to add that the team members whom work on this backend and the server infrastructure ARE NOT the same people who work on these new features. We have several people on different teams who are specialised to different parts of the site/product all for good reason. So, in essence, we’re not ignoring site issues, they are being dealt with simultaneously with all our new features. I assumed as much, but it seems to me to be more sensible to focus all your efforts on getting this place working right. I would have thought that these people could have been useful in other departments, under the circumstances. Regardless, I have another query. A number of users have noticed that the biggest issues with the site (charts not updating, slow pages etc) have occurred around the same time as these apps have been launched. Is this coincidence or can you confirm whether the presumably thousands of users who are using these myspace/facebook apps are drawing resources from servers which we are told are already struggling to keep up with the site’s growth? ie are the rest of us suffering due to the implementation of these new features? Btw, I don’t mean to denigrate the hard work your team put into these apps, I’m sure they did a great job, it’s just annoying that those of us who are waaaay too underground to have a myspace (ie, me) seem to be losing out at the moment! Do we have to start putting up black and white pics of ourselves taken at funny angles while attempting to look ‘pensive’ before we’ll get the same level of attention as our cam-loving friends at myspace? It’s a total coincidence: The facebook apps don’t put much load on our system at all (the myspace/blog widgets even less). 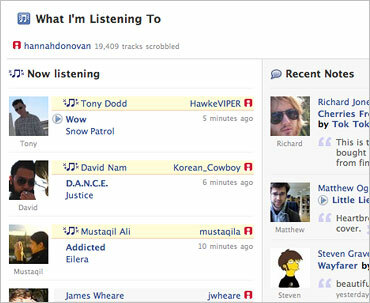 I like Last.fm for the same reason why I don’t like Facebook. Now its pretty much becoming a subdivision of facebook as opposed to its own cool site. I’m in love with Last.fm. Way to go, as the Americans always say on telly. alright, that’s good enough for me I suppose. so… how ‘bout this weather? Quilts??? Artist Quilts? Do they exist? Loving this new app but got a little confused at the start as to which Last.FM app to use on Facebook. I now have two installed and love both of them. Thanks and keep up the great work! Awesome job guys. LOVE the facebook app. Been waiting for something like this. I was wondering though, would the source for the application be available anywhere? I’m actually writing a facebook app for my site (www.myanimelist.net) and basically I’m doing the same type of “recently”, but for anime. I’m having some of those “tech problems” that you guys mentioned too. Hehe. I’d love to look at the code for the developed app if possible. I can be reached at webmaster at myanimelist dot net. Thanks a bunch! Thanks for this new facebook plugin, but one issue I’ve noticed is that it will say “Just Listened” for the most recent track even hours after it was listened to. Wow, great job, thanks guys. Wow this is awesome. Only found out about it by noticing the last.fm footer! You guys rule. I love this new Facebook app – just what I was hoping for… and the new features sound like they will be great fun, too. What you guys should really do is make a single Last.fm app and focus your efforts there. If you work hard on one app that does everything, you’d be more likely to attract more people. I’d love it if my friends used Last.fm. Make it similar to iLike, allow people to add music previews to their profile, display charts..etc.. Thanks for the app. But please! Add an Upcoming EVENTS app!